Click on sections of image to enlarge. Morgan is famous for his Christ­mas Raid of 1862, during which his troops set fire to Union stores, burned the bridge and stockade. The bridge was rebuilt by Union forces. 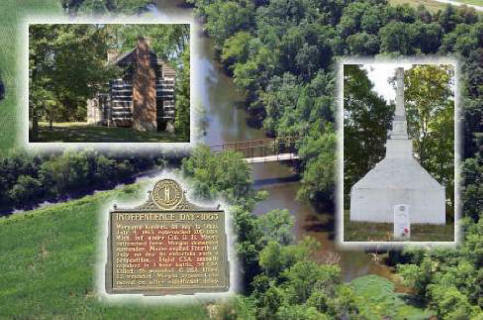 About six months later, Morgan and his men camped at Cane Valley near the Taylor/Adair county line on the night of July 3, 1863, with plans to cross the Green River Bridge at Tebbs Bend. However, five Michigan companies successfully defended the bridge across Green River the next day. In one of his most famous maneuvers, Moore ordered men on horse-back to go back and forth over the Green River Bridge the night of July 3 to make it appear he was receiving reinforcements when! in fact, there was no help for the outnumbered Union forces within 30 miles, At sunrise on July 4, the Union soldiers opened fire on approaching Confederate forces. By 7a.m., a delegation of officers approached Moore's position and demanded surrender Moore replied, "Present my compliments to General Morgan and say, this being the 4th of July, 1 cannot entertain the proposition to surrender. Morgan's men charged the Union defensive line eight times but the Union forces held their position, The Confederate attackers began to run out of ammunition and suffered heavy casualties. Moore sounded his bugle and Morgan thought the Northern reinforcements may have arrived. This action, however, thoroughly demoralized the Southern forces. Morgan's troops withdrew along the bluffs of the Green River, through Lemon's Bend toward Campbellsville. That evening, the troops camped near Lebanon at New Market, where another fierce battle occurred the following day. After his daring campaign through Kentucky and Indiana, Morgan and his men were captured in Ohio on July 26, 1863.